The Bubble Dragon is very playful and friendly. It rarely sits calmly, spending most of its time playing games or mischievous pranks. 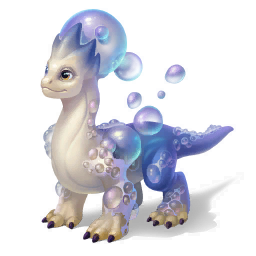 Among the Bubble Dragon’s distinguishing characteristics are the bubbles covering its body and the loud cry it uses to communicate with other members of its species. How to Breed Bubble Dragon? Find out how to breed Bubble dragon with the How to Breed Calculator!